About the owners: My husband Dale and I had the opportunity to purchase a condo in the Destin/Miramar Beach area in 2006. 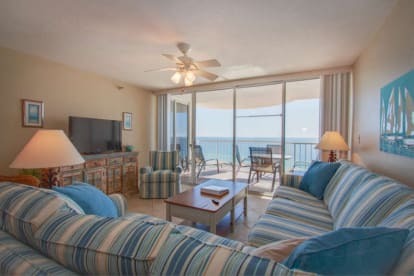 We looked at many condos and when we walked into Hidden Dunes 1105, we knew we had found our new home away from home. The view was, and still is, breath taking! After some major updating we began renting early in 2007. We love... that we do not have any roads to cross and that it is only a few steps to the beach from the elevator and that it is a truly manned gated community with only residents either owners or owners guests allowed to enter. We enjoy being less than a mile away from Silver Sands Outlet Mall and so close to some amazing restaurants! The beaches on the Emerald Coast are some of the most beautiful we have ever seen and enjoy walking on the talking sand each time we stay here! A bit about us - We live in a small town in Illinois, just across the river from St. Louis, MO. We have two married, grown children and two step-grandchildren. Dale works in safety for a company in St. Louis and I teach elementary school at Scott Air Force Base. We enjoy vacationing at the beach and began going to Destin in the early 1980’s.